Hampi the 14th century capital city of the Vijayanagar Empire lies in the Deccan heartland, in the state of Karnataka. The ruins spread over an area of more than 26 sq. 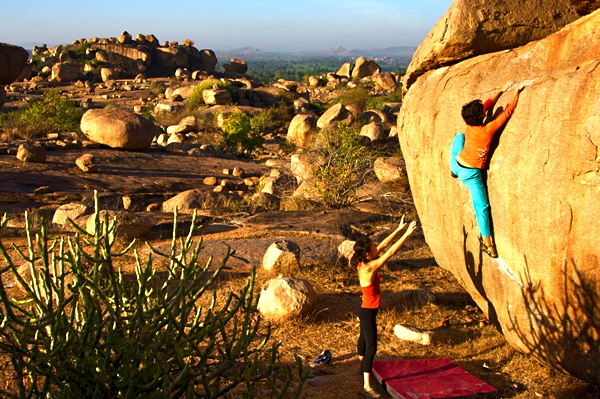 kms protected by the tempestuous river Thungabhadra in the North and by rocky granite on the other three sides. A terrain such as this was excellent for a capital city that needed to be vigilant. It may not have been military shrewdness alone that made the god-conscious Vijayanagar kings settle for this fierce landscape and build on it one of the great imperial cities of medieval times. It was believed to have been the site of the monkey kingdom of Kishkindha associated with the Hindu epic, the Ramayana. The presence of a large number of monkeys seems to testify to that. HAMPI, the abode of Lord Virupaksha and his consort Pampadevi, has a hoary past. Traditions and local legends speak of the penance of Shiva on the Hemakuta hill and his subsequent marriage with Parvathi. 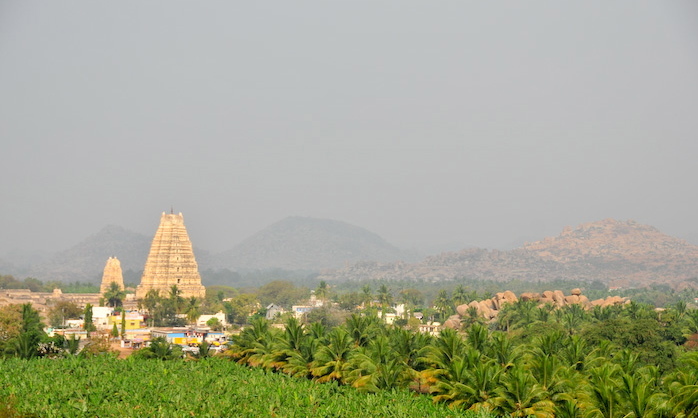 The ancient Kishkindha of the Ramayana was situated close to present day Hampi. This is the site of the fight between Vali and Sugriva, killing of Vali by Lord Rama, and the subsequent stay of Rama in Malyavantha Hill when Hanuman went in search of Sita to Lanka. Thus, many of the sites: Matunga, Malyavantha, Rishyamukha, Anjanadri Hills and Pampa Sarovar and Sita Serugu are all associated with RAMAYANA. 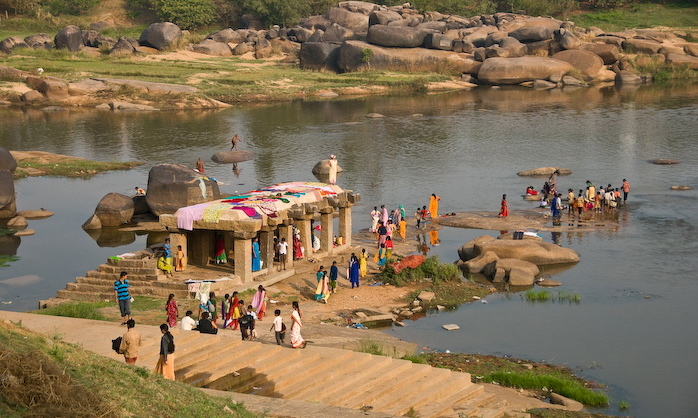 Hampi or Hampe is generally held to be a later Kannada form of the term Pampa, the ancient name of the river Tungabhadra. The site is naturally endowed with great strategic importance. 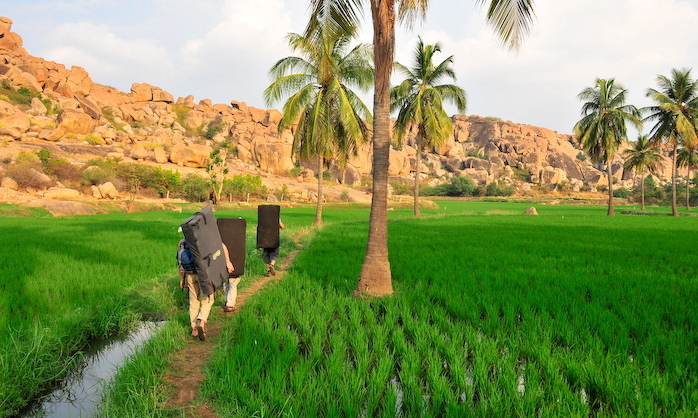 The wide, torrential Tungabhadra on one hand and the rugged hillocks on the other made it a natural fortress. These factors no doubt induced the Vijayanagara rulers to choose this site. What was once only a pilgrim center of the devout became the seat of a mighty empire.